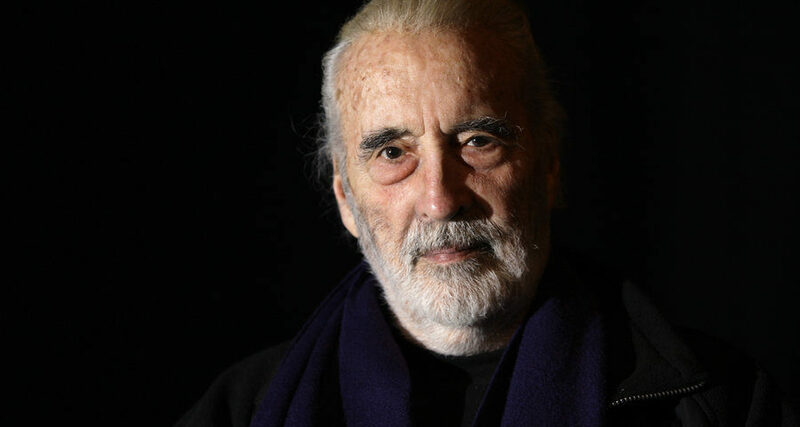 Recently Star Wars fans were saddened to learn of the death of Sir Christopher Lee. He became an integral part of the Saga when he embodied Count Dooku in Attack of the Clones and Revenge of the Sith. Because of who he was — not solely within the world of Star Wars, but the world as a whole — it’s appropriate to take time to recognize what this great man accomplished in his lifetime. Few can boast of a life and career as varied, remarkable, and long-lived as the one Christopher Lee carved out for himself. He was a towering presence, both in his physical stature and his graciousness. Lee was born in London on May 27, 1922. Through his mother, an Italian Contessa named Estelle Marie Carandini di Sarzano, he was a descendent of Charlemagne. His father was Lieutenant Colonel Geoffrey Trollope Lee. After his parents divorced when he was six, his mother married Harcourt George St. Croix Rose, a banker. Lee had an older sister, Xandra (1917–2002). Lee was a cousin — through his stepfather — of James Bond creator Ian Fleming. Of course, one of Lee’s classic roles was Bond villain Francisco Scaramanga in The Man With the Golden Gun (1974). He was also distantly related to Confederate general Robert E. Lee and astronomer John Lee. His military career was distinguished by service in the Royal Air Force (although unable to fly due to a failed optic nerve), and as an intelligence officer during World War II. I’ve seen many men die right in front of me – so many in fact that I’ve become almost hardened to it. Having seen the worst that human beings can do to each other, the results of torture, mutilation and seeing someone blown to pieces by a bomb, you develop a kind of shell. But you had to. You had to. Otherwise we would never have won. After the war, Lee continued his service with the Central Registry of War Criminals and Security Suspects, an organization tasked with tracking down Nazis. In 1960, Lee married his wife, Danish painter and model Birgit “Gitte” Krøncke. Together they had one child, Christina Erika Carandini Lee, in 1963. Not wanting to return to an office job he held prior to WWII, Lee was talked into trying his hand at acting by his cousin, Nicolò Carandini, the Italian ambassador to Britain. Lee liked the idea, and the rest is history. He was friends with two film legends; Peter Cushing — an actor with his own Star Wars legacy as Grand Moff Tarkin — and Vincent Price. In the video below, Lee recounts his friendship with both men, and how much they were missed. One of Lee’s most famous starring roles alongside his friend Peter Cushing was the 1958 Hammer film, Horror of Dracula. His most famous contemporary roles were in The Lord of the Rings and Star Wars. Lee, who was acquainted with J.R.R. Tolkien (in fact, he was Tolkien’s choice to play Gandalf in any film adaptations), played Saruman in The Lord of the Rings trilogy, as well as in The Hobbit films, An Unexpected Journey and The Battle of the Five Armies. In Star Wars, Lee brought Separatist Leader (and Sith Lord) Count Dooku to life in Attack of the Clones and Revenge of the Sith. It will be more than another part. It will be another ‘arrow in my quiver.’ I’m looking forward to it enormously. He returned as Count Dooku in the animated film, Star Wars: The Clone Wars, in 2008. • He also holds the record for the Tallest leading actor — at 6’ 5” — a title now shared with actor Vince Vaughn. • He also holds the record for Most films with a swordfight by an actor with a total of 17. • In 2004 he contributed to a record for First spoken dialogue in an MMORPG after lending his voice to the game Everquest II. • In 2009 he set the record for Oldest videogame voice actor as Diz/Ansem the Wise in Kingdom Hearts 358/2 Days. Following his death, George Lucas, Kathleen Kennedy, and Peter Jackson paid tribute to his life. Sir Christopher Lee… Requiescat in pace. Extraordinary tribute. Fitting for an extraordinary soul…well-done! Thank u for a great article on Sir Christopher Lee, my favourite screen idol, i miss him dearly and i have loved him and his films since 1958, i shall keep my happy memories of him close to my heart and shall never ever forget him.R I P Christopher may God’s blessing be with you for all eternity. I am glad you enjoyed the tribute to Sir Christopher Lee! It was my honor to remember him in such a way.